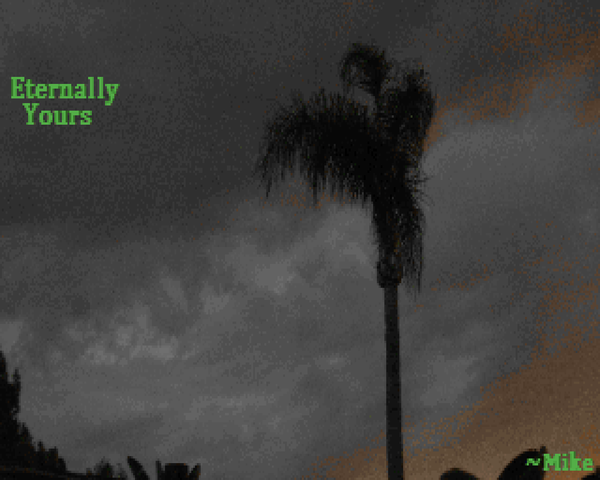 Eternally Yours is the third and final entry in Michael Jan Krizik's "Doom Core" trilogy. 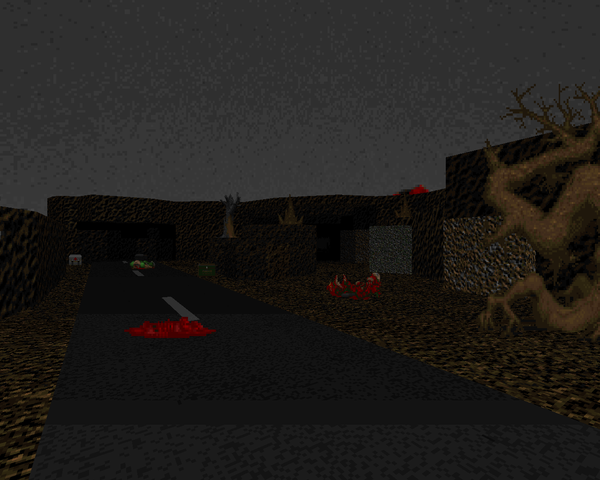 Unlike its forebears, it's not a megaWAD, instead weighing in at an eleven-map episode for vanilla Doom II. If Doom Core and Reverie were double albums, Eternally Yours would be something of a hybrid-rarities LP, featuring three early maps since tuned up to his current standards and two birthday presents for Doomworld forum superstars "Phobus" and "Deathevokation", the other six levels being brand-new offerings much in line with his existing material. Together, it's another delight for fans of valkiriforce's style, ostensibly a way for him to make his peace with the last of his remaining earlier material. 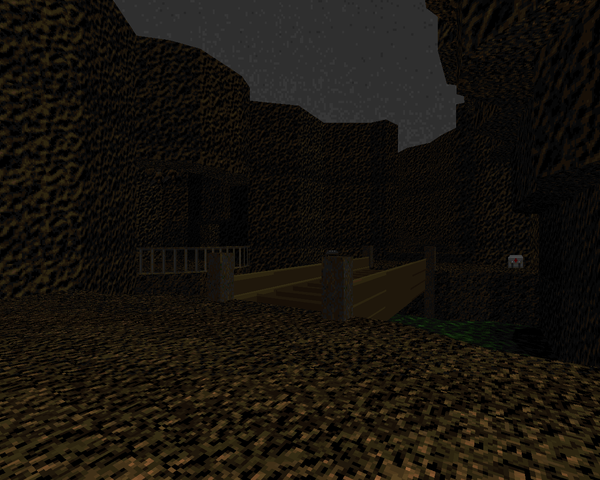 The overall composition is a mixture of techbase and demonic ruins, with plenty of combinations in between. Krizik is an experienced vanilla mapper, and isn't shy about using the tricks of the trade (mostly reserved for MAP09). It's not as puzzle-heavy as his other outings (with a few exceptions); the focus is usually on exploration and combat. You may find yourself wanting for health in some spots, but you'll rarely be short ammo. Admittedly, I sometimes found myself down a weapon when I explored the play area in a less than optimal fashion, an issue not uncommon in less linear maps. You can usually scrape with what's given. The maps are mostly medium-size with a few larges in the mix. They all have some kind of a major design feature, like the atrium of "Meshing Core" or the teleport jaunts of "Excursions". In the notes, he directly mentions some classic authors behind the inspiration for a few designs, with the resemblance quite obvious. They're still tethered to Krizik's design sensibilities as he puts his own spin on the concepts therein. I could mistake "Woodheart" for a miniature "City of the Unavenged", but both maps clearly delineate toward the endgame. 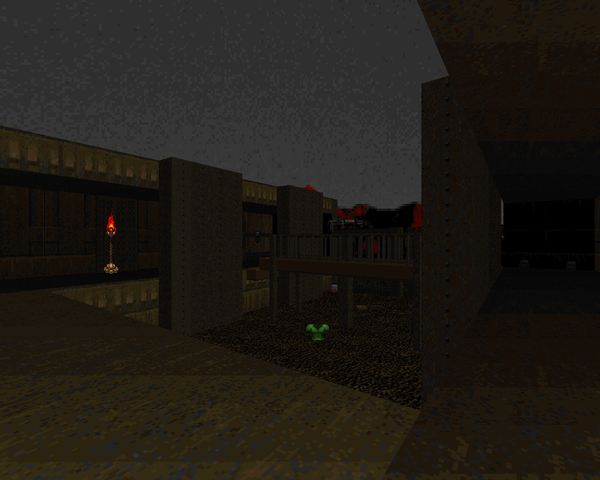 If you want a nice, vanilla Doom II episode to blast through with the level variety of classic megaWADs of yore, you should take a look at Eternally Yours. If you loved Doom Core or Reverie, this offering should come as a no-brainer. Personally, it's nice to get this kind of installment in a more manageable portion. I'd recommend it to anyone looking for more '96-'97 Doom II action, more so if they like their gunplay with a dash of puzzle solving. I'd like to see him tackle something with a more coherent theme and story, like Perdition's Gate, but what can you expect from someone who gets his ideas from dreams? I mean, besides wicked cool stuff and forgetting to wear your armor to the Entryway. Starts out with a "house" map, funnily enough. Looks nice, with Krizik's customary detailing and some snazzy lights. 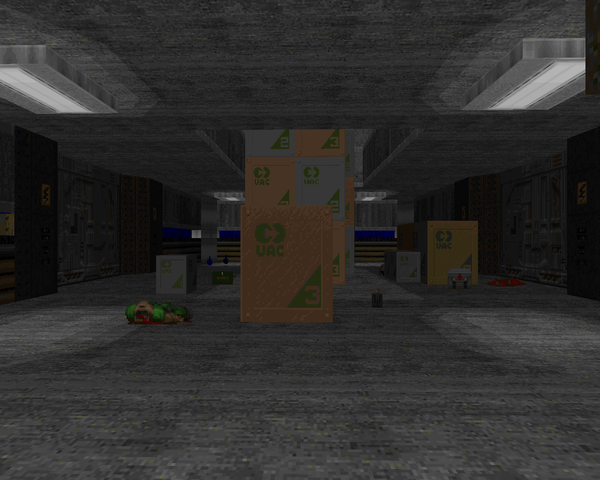 The interior isn't that threatening, filled mostly with zombie trash. When you hit the porch, though, you'll have to contend with some commandos and a horde outside and to the west that require some consideration. My favorite segment of the house is the kitchen area, with several approximations of roaring fires. There's also a well-hidden neighbor house you can investigate if it pleases you. 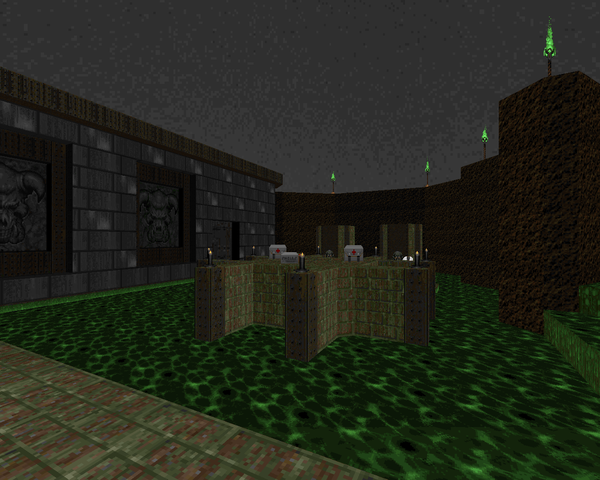 Medium-size techbase map with an emphasis on exploration and ammo and a beginning that feels oddly similar to his "Stormfall" from Doom Core. You'll want to search around for some potent arms before triggering obvious key traps. In particular, it's possible to get into an uncomfortable situation if you don't grab the plasma rifle before taking the yellow key. You can probably deal with it if you grabbed the berserk, but I wouldn't recommend it. The blue key trap to the north is my standout encounter, which introduces some toughs into an awkward space while simultaneously removing precious cover. I like the ending spaceship escape. Short, cool outpost-style level that refuses to let up on action. It's very linear but without drawing a straight line and wisely reusing space, like the yellow key junction in the atrium. The encounters are mixed and deadly, with the western wing being my favorite and sure to annoy Doom II haters, putting the player between a pair of pain elementals, a pair of revenants, and a mancubus on a center platform, with some specters on the ground running interference. Really, excepting the little cave annexes off the north wing, you can easily divide the map into five separate encounters, some more challenging than others. One detail that would have been appreciated – something exciting when returning to the east with the red key. A compact merger of a Stygian castle and techbase, separable into the west and east halves, respectively. 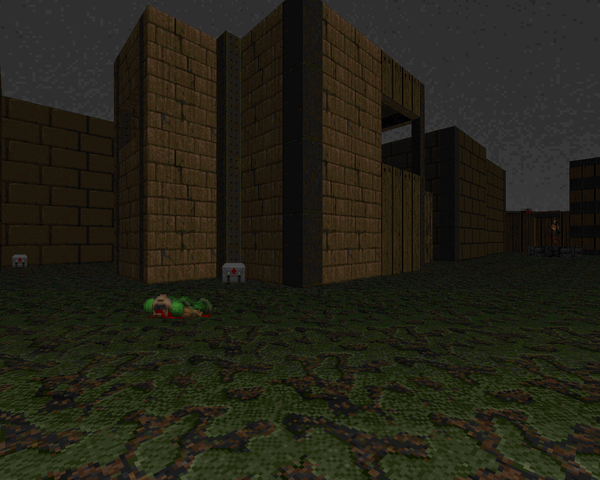 Some slight puzzle elements, like the blue key grab, but this map is mostly about rough and tumble ambushes where it pays to be observant, not the least because you can snag some tasty secrets. The southwestern leg is my favorite part of the whole map, with the nasty corpse room and its baron pillars, not to mention the plasma rifle room, which is full of surprises for the unwary. The spiral descent to the north is a nice bit as well. Love the detailing here, and the use of the modern elements for the map's large outdoor area is a nice contrast. Good stuff! This big, gritty base level is a blast, provided you don't overlook the switch in the blue key room. It bestows upon the the combat shotgun, and you'll be wanting it for as much skirmishing as you can do. 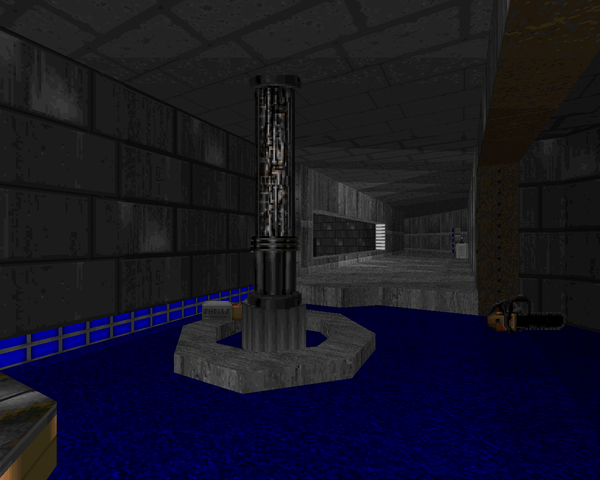 The level is in a sort of hub arrangement that begins on a pillar in the middle of a cistern. You gradually raise the catwalks to the areas built into the outer rim, with the north and south halves joining up once you have the red key in hand. There's a lot of close-quarters fighting with revenants and other things, which is why the SSG is so critical. 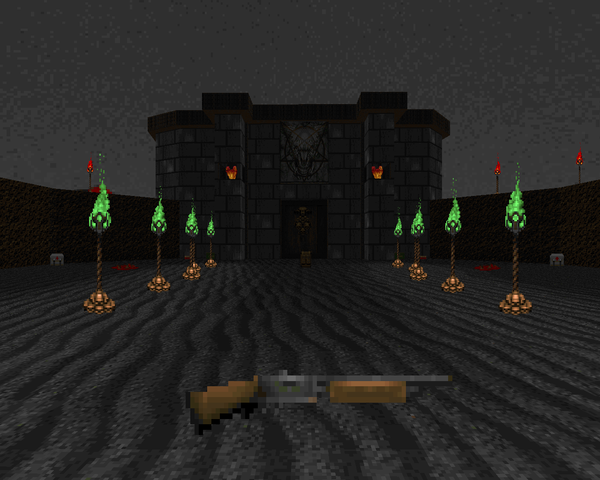 The rocket launcher is ideal for a few scenarios, especially clearing out the eastern hallway, which is loaded with meat. I really like all the sector machinery and faux-3D stuff, crossing over lower hallways and in particular moving from the northwest corner of the southern room to the northeast, splashing the incumbent skeletons with plasma. You have your choice of exits, but the wrong one will result in a tense arch-vile showdown and end with a cameo from Romero. Starts out on a caved-in mountain road and quickly delves deep into a subterranean nightmare. Krizik isn't afraid to start swarming you with nasties. Your first dip into the water prompts an assault by demons and, of course, cacodemons, that you'll have to knock down in order to make spelunking safe. All of the raised walkways have patrolling packs of imps to keep you busy. Valkiriforce makes good in spite of the limited playing area, with a few more aerial assaults, like a bevy of pain elementals or one final gasp of cacos near the end. My actual standout encounter is probably the eastern room, which dumps one of these mini swarms in a much more intimate space. Think "City of the Unavenged"-light (so minus the Cyberdemons). It's definitely an inheritor of Nielsen's peculiarities, with a ton of switches to flip, some of which have no immediately obvious effects. A quick scan of the grounds will reveal some other button to press, supposing you've already exhausted the buildings. Expect a lot of dangerous combat, like the hectic opening firefight where enemies from elsewhere tend to sneak up on you, traps forcing you to fight in close-quarters, or the end of level stretch of "find the arch-vile". Very nice, secret-dense, and with an enclosed area off to the west that refreshingly puts the player back into the unknown. Don't let the arch-viles resurrect that arachnotron! 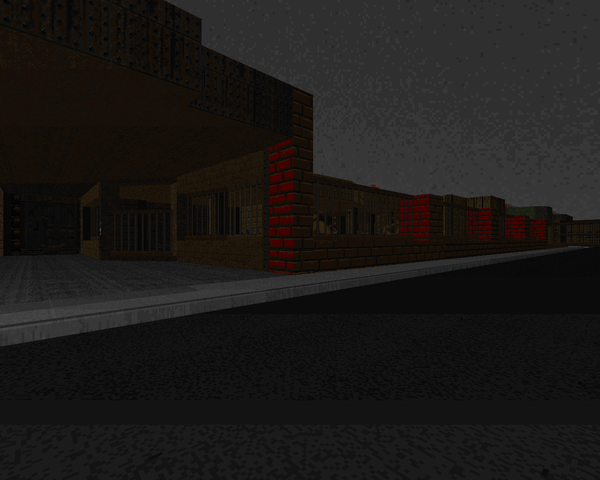 This time, Krizik takes a page from Mr. Badorek of MAP21 fame. "Ion Station" is a large techbase filled with all sorts of nooks and crannies and plenty of different themed areas, much like "Twilight Lab". 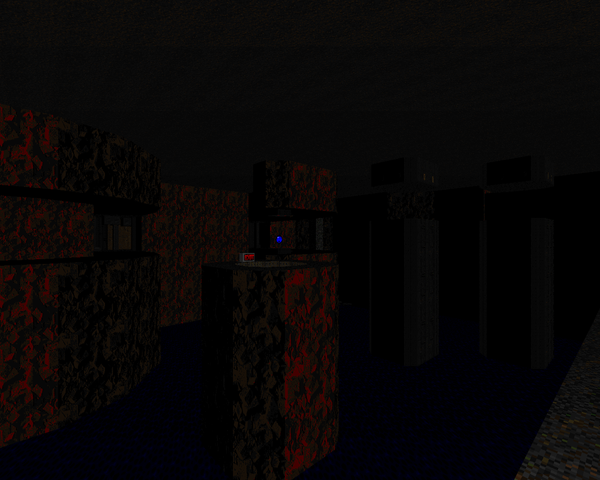 It's a lot of fun to explore, poking your SSG where the Hellspawn don't like it. 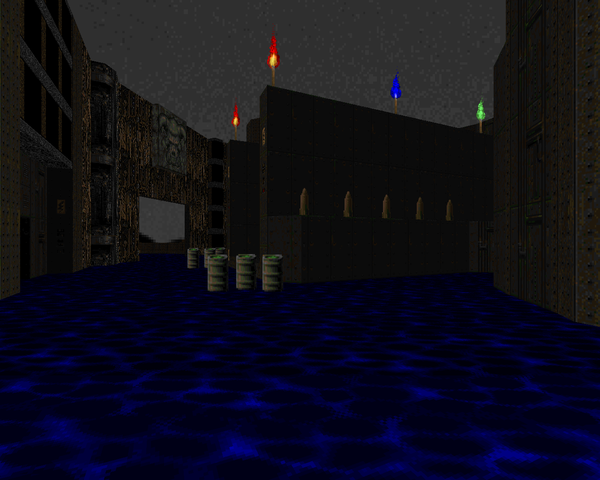 I really like the aquatic areas of the map, those being the sewers to the northeast (with vanishing tunnels evoking a sense of depth) and the southeastern sluice, which has a pleasant shootout around the top. While there are a lot of lower-tier enemies to disassemble, don't be lulled into a false sense of security. 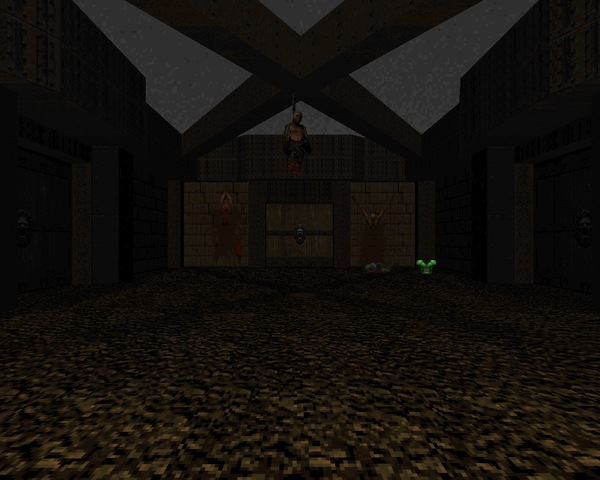 There are plenty of encounters to test Doom II veterans, like the (very obvious) southwest teleporter trap. A great level. More or less Krizik's SFX level, with tons of faux-3D bridges criss-crossing, a swinging door, and even a fake floor for some more 3D action with the key-switch annex. Of course, he backs up all this eye candy with plenty of action. Even at the beginning you'll have to face a ring of hitscanners while two arachnotrons raise Hell at your back. 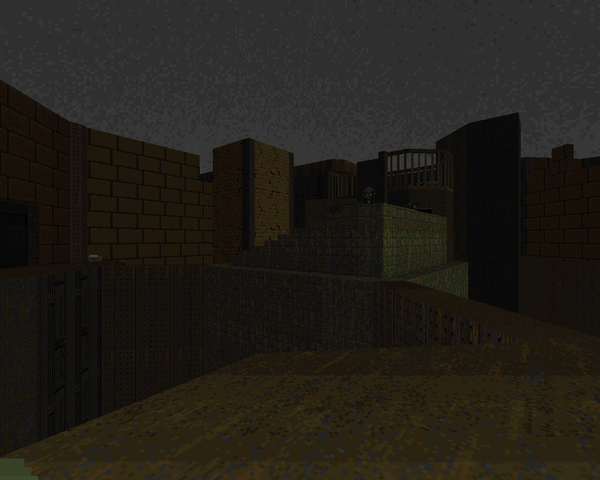 The western section, where you acquire the keys you use to open up the end of map exit, has more claustrophobic gameplay that slightly suffers due to the safeguards put in place to prevent monsters from ruining the mapping magic. Case in point – two arch-viles are forced to wait on the other side of the bridge back to the main area, which allows you to pump their crowd with rockets until they succumb. Still a very nice play. Valkirforce takes things in a more modular direction. After grabbing your goodies you head off to the central hub, where eight different teleporters are marked with different runes on the walls. Each one takes you to a new combat scenario. Three contain keys, three require keys, and one is only available at the end as the warp to the level's exit. Each one is kind of tough to start with, but carrying ammo and weapons over from the others increases your survivability. Highlights include the northeastern area, which is rich in monsters and forces you to clear some safe space quickly, and the tricky southwestern room, which manages to cram in a nasty aerial ambush as well as a Spiderdemon finale (that's admittedly pretty easy to take down). Very cool. The finale starts out with some good ol' fashioned monster killing. You quickly reach a crossroads where you can grab either the red key or the blue key first. The red key wing is kind of a mini-TEETH, but much easier to sort out, though the elevator joyride might wear a little thin for run and gunners. The blue wing is a bit more traditional, with a rather tense courtyard fight both entering and leaving. The plasma rifle is essential here and elsewhere. 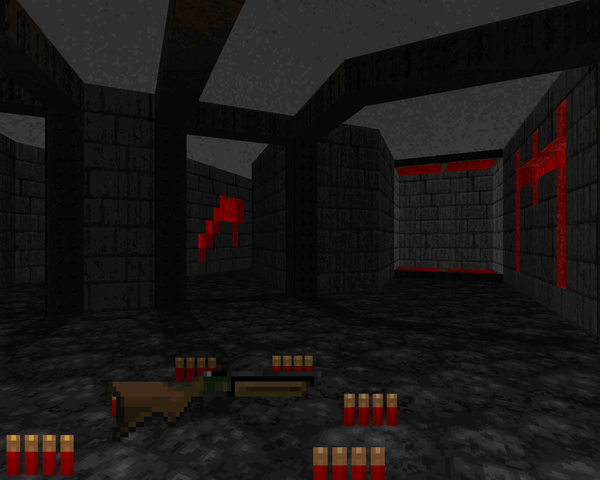 The boss shooter is made pretty simple by BFG access and scads of ammo. You have to leave the protective shack and flip some switches on the outer ring, accessed via teleporter, before you get the switch that exposes the boss brain to fire. Dig in, though. He's got a protective shell you have to punch through. 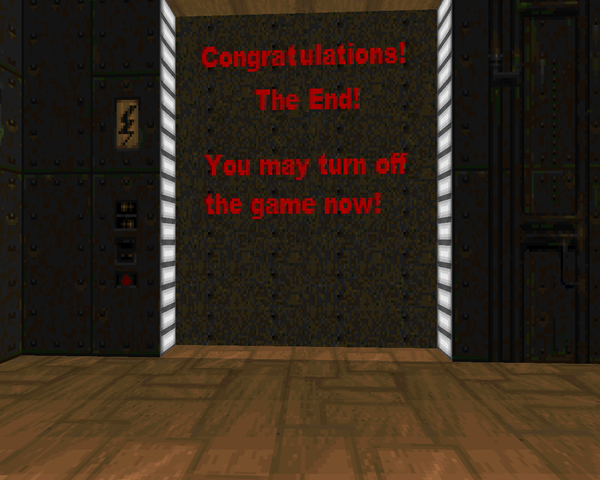 Just a short gallery of credits to keep you from moving on to the rest of the Doom II IWAD. Hope you enjoyed! Hey, just noticed - MAP05 has the same description as MAP03. Just thought I'd let you know. fixed! thanks for the reminder! I'm not sure if I'm seeing things but map 10's review appears twice here. I'm trying to think of what happened here and I believe that at some point after publishing the original review I decided to add another infobox for MAP12. If I recall correctly then this was after IMGUR blocked this blog. But, uh, something obviously got the better of me. Thank you for the heads-up!